The first flavors I pick up on the palate is a seasoning blend with a light amount of spice. The garlic shows up first, along with black pepper, and a savory blend of soy sauce and worcestershire. 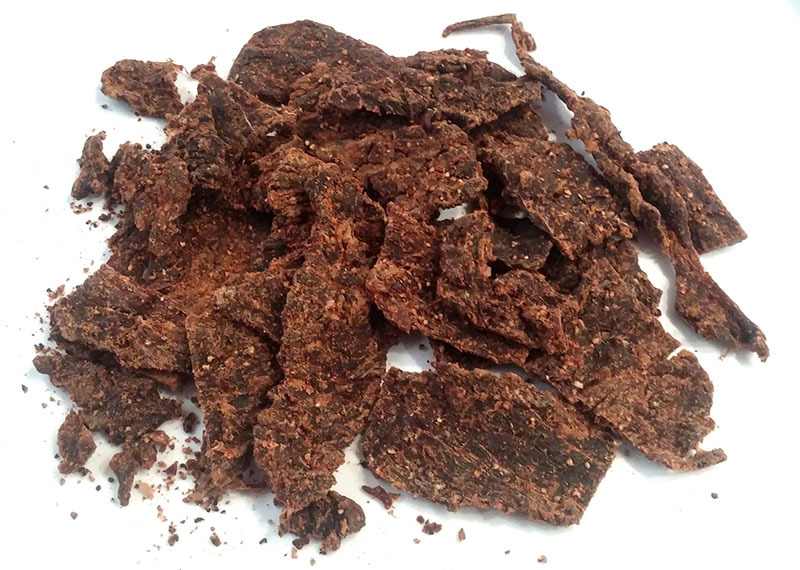 The chewing brings on the natural meat flavors with a light bit of tanginess. The heat builds up a little. As for being described as a Bloody Mary inspired jerky without the tomato and vodka, it seems to hold up well. It's more like the bits of seasonings in the bottom of the glass that hit your tongue on the last drink than anything else. The Old Bay and Tabasco brings in that spicy Bloody Mary flavor, and there's a light bit of worcestershire to help cross the bridge from cocktail to meat snack. The celery salt, too adds to the Bloody Mary character. 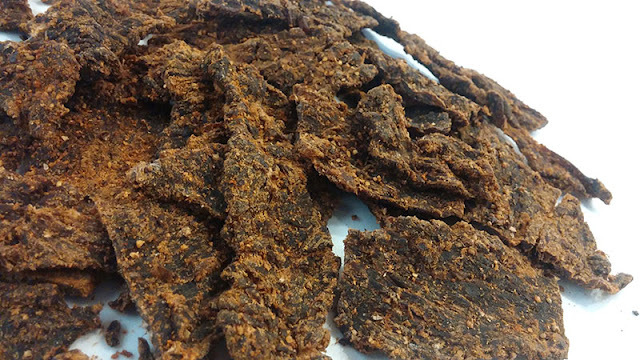 Otherwise, the primary taste profile of this jerky is a strong seasoning blend, noted by the salt, garlic, and black pepper, with a light and tangy worcestershire base, and a moderate level of heat (level 3 out of 5 on my heat scale). The salt feels on the higher side of medium, while the natural meat flavors are there in a supporting role. 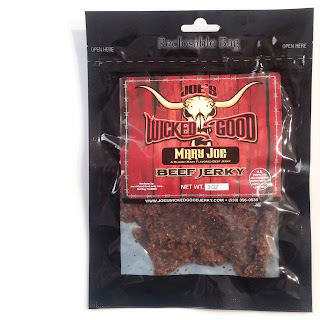 This "Mary Joe" from Joe's Wicked Good Jerky manages to reflect everything about the popular cocktail just without the tomato and vodka. It tastes like something that will do really well as an actual Bloody Mary garnish due to its stronger seasonings, and will add a burst of spiciness if your bartender served up a weak one. 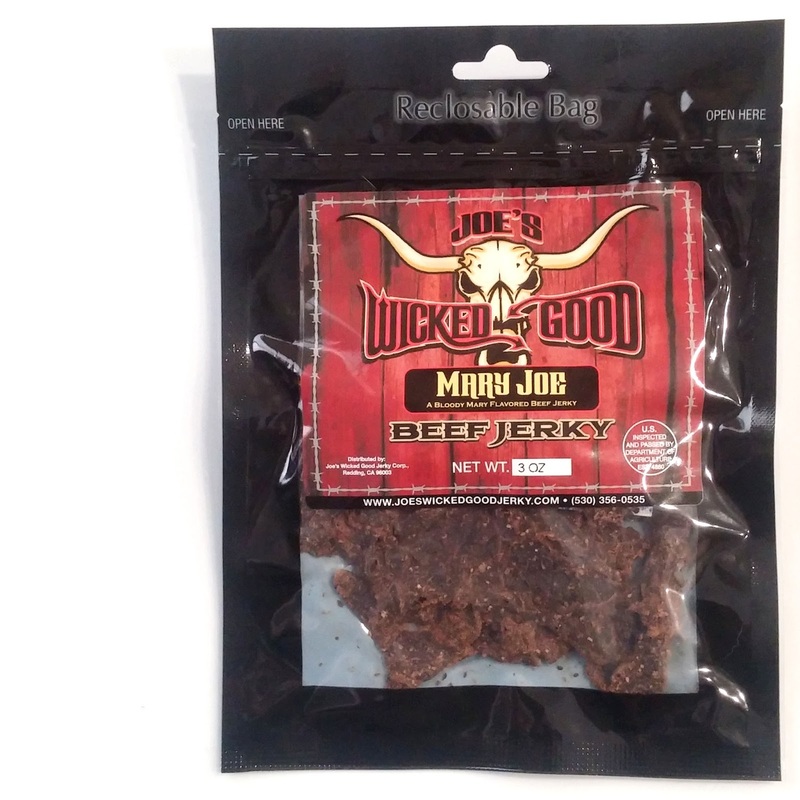 It's probably also a good "hair of the dog" jerky for those who need to wake up with a breakfast of champions. And there's enough seasonings left in the bottom of the package that you'll want to rim your glass with them.